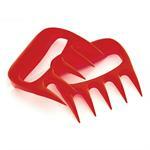 Grab every last buttery morsel of seafood using this 5 Piece Cracker & Pick Set. 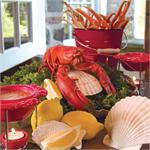 Constructed of a sturdy zinc alloy, this set is tough enough to break open the shells of crabs and lobsters. Keep a set of these on hand for cracking nuts. 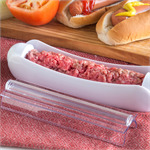 Create your own ¼lb 'hot dog' and stuffed 'hot dog' using any ground meat or meat alternative. There is even a stuffing feature to add an extra surprise of flavour, try stuffing them with cheese, avocado, sauerkraut, jalapenos, horseradish, bacon, etc. 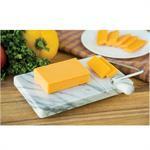 Marble Cheese Slicers keep cheese cool and cuts straight. Evenly slices through most types of cheese. 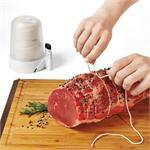 This set of meat shredders is a multi-use kitchen tool. 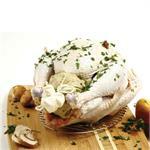 Use for transferring roasts and turkeys from pan to platter or plate. 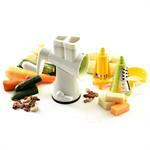 They also easily shred pork, beef, and chicken or toss and serve your salads, pasta, slaws. Two piece non-stick 9" x 5" pan set is ideal for meatloaf. 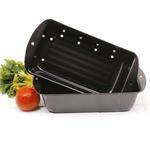 The inner pan is perforated so grease can drain into the bottom pan during cooking or roasting. The bottom pan can be used separately as a loaf pan. 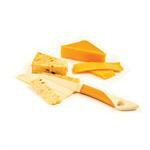 Guests will smile at this cheese knife set for hard, firm, semi-soft and crumbly cheeses. The different shapes of knives cut any type of cheese - hard, firm, semisoft, and crumbly while the fork will hold a block of cheese in place while cutting. 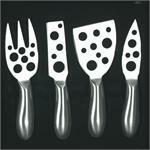 This set of four stainless-steel 'holey' cheese knives cut any type of cheese - hard, firm, semi-soft, and crumbly. 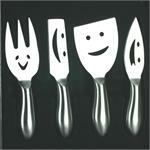 The cheese fork is used to hold a block of cheese in place while you cut or slice with a knife. Claws cause problems? Not when you use these lobster crackers to break open lobster claws, and crab legs. 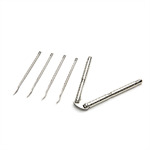 This heavy duty, stainless steel cracker can also be used for other shellfish and nuts. Crack shells, claws and even nuts of all sizes with these sturdy crackers and the picks to reach every last tasty morsel. Each pick is double ended with a scoop on one end and a fork on the other. 8 piece set includes 2 crackers & 6 doohickeys. 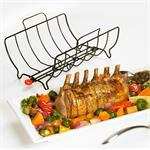 The Nordic Ware Microwave Compact Bacon Rack is compact enough for even the smallest microwaves. 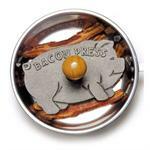 The ribbed design drains grease; it works great for cooking bacon, sausage, hot dogs and more. Made in the USA and is BPA and melamine free. This four piece heavy duty plastic press is so easy to use. Just place a mound of raw meat in the centre of the base and press down with even pressure. 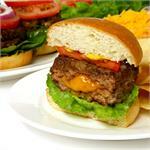 The inner tray lifts out and the burger falls off with a little nudge. Our favorite patty maker. You won’t lose your twine in the bottom of your cupboard, or contaminating with smudges of food & grease on it from when you are preparing and handling food. Easy one-handed operation while the non-slip feet keeps it steady while cutting. The cast iron Panini Grill Press helps bacon to cook evenly, presses out excess fat from hamburgers, & allows you to create delicious grilled panini sandwiches. 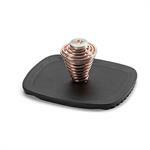 By adding the weight of the Panini Grill Press you significantly shorten the cooking time. Inject marinades, flavoured oils, wine, liquors, butter or juices into any meat as well as fruit, plum pudding, fruit cakes, and more. 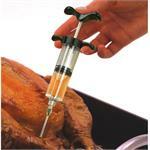 Heavy-duty stainless steel injection needle dispenses marinade where you want it. Large capacity and easy to clean. 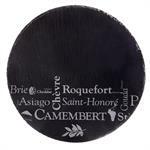 Cut and serve both hard and soft cheeses with style. 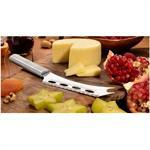 The cutouts in the blade reduce resistance while the ridge gently separates and cuts. 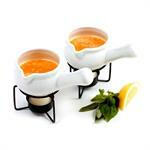 The angled handle provides leverage and the forked end can be used for serving. Left or Right handed use. 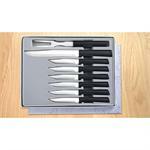 Eight piece Rada Meat Lover's Gift Set includes six serrated steak knives, slicer, and carving fork in a beautiful gift box. Surgical quality high carbon stainless steel blades are hand sharpened for a razor sharp edge. Made in the USA. 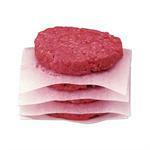 Patty papers eliminate the frustration of having to pry frozen burgers apart. Made of dry wax treated paper for moisture resistance and easy release, they have lots of uses. Remove the sock, keep the stock! Simply place your poultry bones, vegetables such as onions and celery and your spices into the soup sock, tie a knot and submerge into your stock pot. 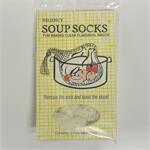 Once your stock in finished carefully remove the sock, bones & all. Imagine your favorite home-made stuffing, infused with the natural juices of the poultry and served without any mess - never having to scrape it out of the cavity again. Fine mesh cotton bags that hold your stuffing together & can be easily removed. Press the poultry timers legs down. Cook poultry as recommended. Legs automatically pop up to a vertical position when poultry reaches 160°-165°F. (Don't worry he won't run away, you can use him over 300 times). 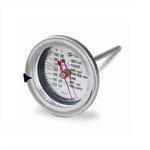 Does it annoy you when the baster tube is perfectly fine and the rubber bulb goes rotten? This no-mess baster features a flat-top silicone bulb which allows it to stand upright so your liquid stays in and counter stays clean. 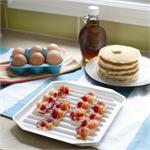 Heat resistant, food grade silicone rack fits a variety of pan sizes, is easy to clean and can also double as a trivet. Elevate your roasts, chickens, fish and more for faster, healthier cooking. Heat resistant to 500°F (260°C) and won’t rust or warp. Overstuffed or improperly sealed patties end up oozing the filling all over your grill causing flare-ups and making a mess. 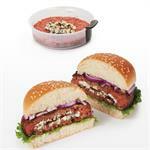 The Stuffed Burger Maker eliminates these problems by stuffing and sealing the right amount of filling with the right pressure.